Imagine a place where adventure is common. Where new species above and below the water line are discovered regularly. A place where rumors abound of villages lost to the modern world and where many cultures fuse into beautiful displays, festivals and dances with kind hospitality towards visiting foreigners. This is Papua New Guinea. Authentic. A land of a million different journeys. As you can imagine, the scuba diving and underwater photo opportunities in Papua New Guinea are magnificent and almost appear unending. The reefs and marine life feel wild, and have a totally different vibe than the reefs I’ve dived in Indonesia or the Philippines. 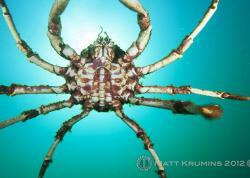 So why should you visit PNG as an underwater photographer or videographer? We break it down into four categories. Looking for macro amongst the wide-angle in Kimbe Bay. 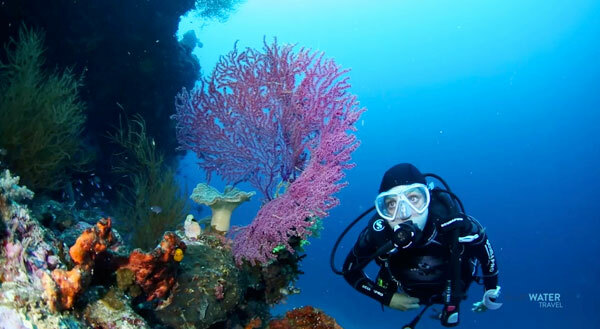 Scuba Diving in Papua New Guinea is for travelers - not casual tourists. Land Cruisers and trucks roam the streets telling tales of cowboy road adventures (dirt roads). For someone like me, this is an exciting sign right upon leaving the airport. I stayed at Walindi Plantation Resort in Kimbe Bay and Lissenung Island Resort in Kavieng - both of which are run by pioneers of diving in Papua New Guinea. Both resorts are in beautiful settings, offering divers relaxing visits, great food, land activities and of course, incredible diving. 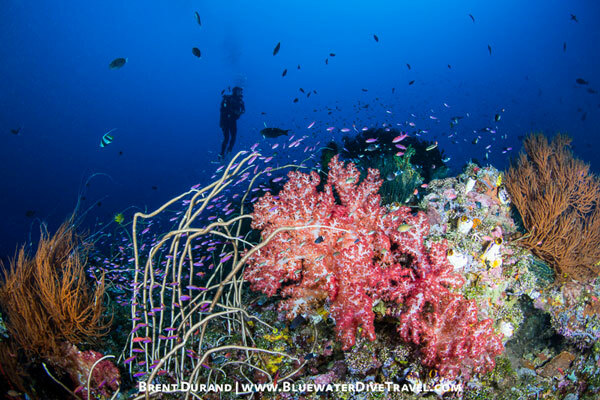 There are stories about the name of each reef and you might even have the opportunity to dive a recently discovered reef. 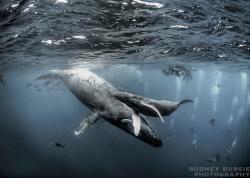 Underwater, you never know what you’ll see. A seamount or a wall might bring passing sharks (including hammerheads), big schools of jacks or barracuda or any of many other surprises. 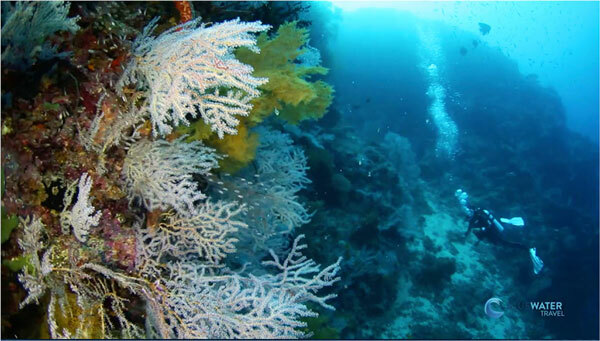 An average reef in Papua New Guinea - simply spectacular! Comprising a major section of the coral triangle, the marine life diversity found across Papua New Guinea is incredible. 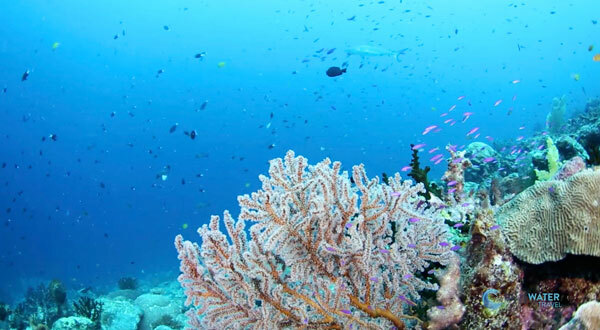 Wide-angle photographers will be drawn to vividly colored whipcoral reefscapes, enormous fans, sponges and ornate hard and soft coral colonies. Reef sharks swim laps off the walls and massive schools of fish gather during the right tides. 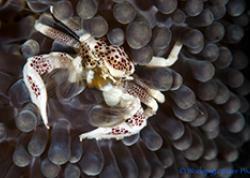 Macro photographers should pack extra memory cards because you’ll find everything from frogfish to nudibranchs to octos to the tiniest shrimp and crabs. I was so consumed by the wide-angle opportunities that I didn’t shoot macro, but cannot wait for the next opportunity to get back in the waters of PNG with a macro lens. 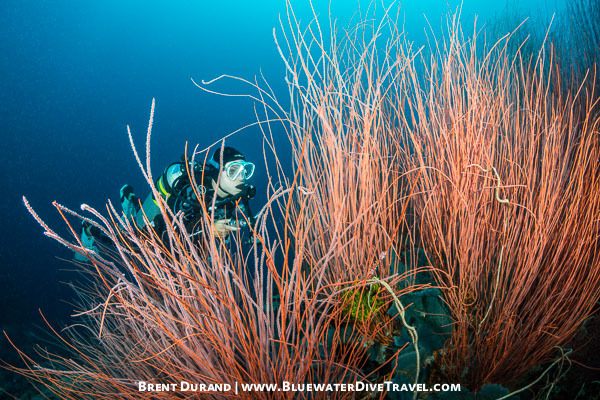 A gorgonian grows off of a wall in Papua New Guinea. 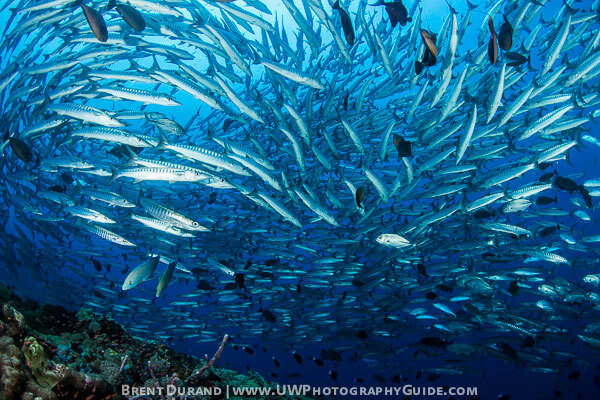 Schooling barracuda await divers visiting Papua New Guinea. (Papua) New Guinea saw some serious military action as part of the Pacific Theater during World War II. 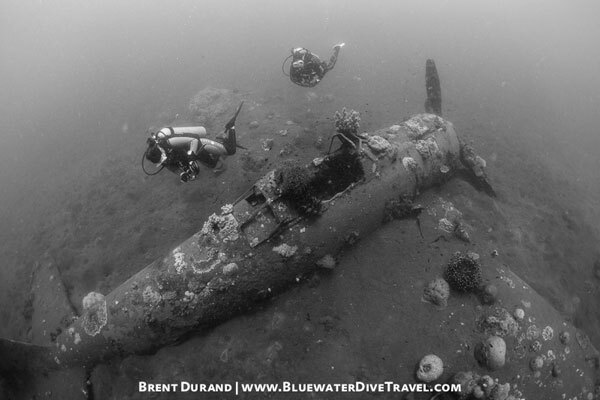 Many books and resources exist for WWII enthusiats to study, but suffice it to say that there are plane wrecks all over Papua New Guinea, both on land and in the ocean at recreational dive depths. One interesting fact is that many planes were landed/ditched in shallow water after running out of fuel, meaning the pilots were able to safely escape while the plane remained intact in shallow water. There are many, many planes awaiting scuba divers, and many still waiting to be found. As an underwater photographer, you will have to make the decision to shoot wide-angle photos of the wreck or to set up for macro to enjoy the wealth of marine life living near these artificial reefs. Compact camera shooters have the clear advantage here! A sunken Zero fighter aircraft in Kimbe Bay, Papua New Guinea. 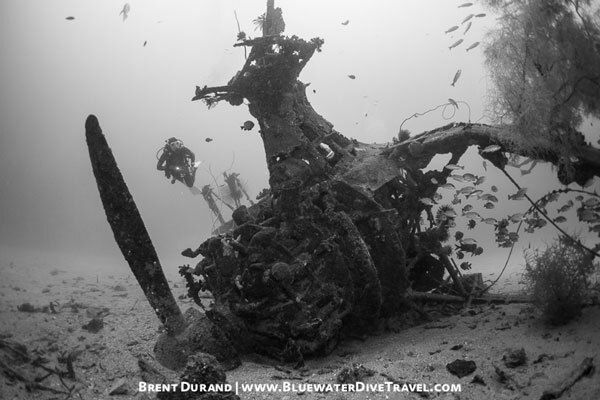 The "Deep Pete" plane wreck in Kavieng, Papua New Guinea. One of the main reasons to visit Papua New Guinea is the unique fusion of cultures, languages and traditions. Papua New Guinea is the most linguistically diverse place on Earth, with over 850 local languages. Locals communicate with a pidgin dialect, Tok Pisin, but English is widely spoken at the dive resorts. Like with all travel, try to learn a few words and you will be having conversations with your dive guides about anything you’d like, from the school systems to culture to personal histories. Want to see incredible celebrations and festivals? Make sure to plan your trip around a Sing-Sing. Want to do an epic hike after the dive portion of your trip? Bluewater Travel can set you up with a hiking tour at the iconic Mount Hagen. Want to bring back some authentic art? The dive resorts have connections to source art from most regions in PNG, and often have a large selection of artwork on display for guests. 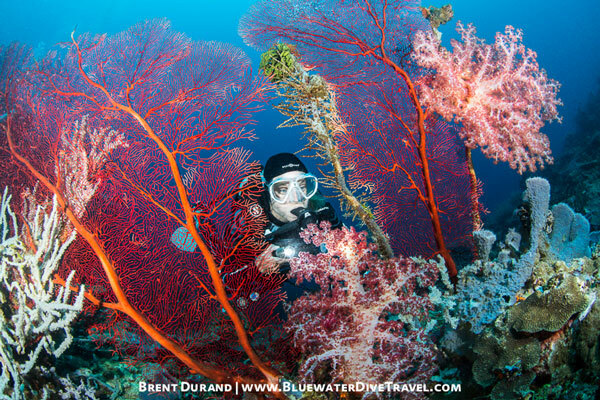 Papua New Guinea, Kimbe Bay in particular, is known for incredible whip coral gardens. Shot during Bluewater Travel's Best of Southeast Asia tour. 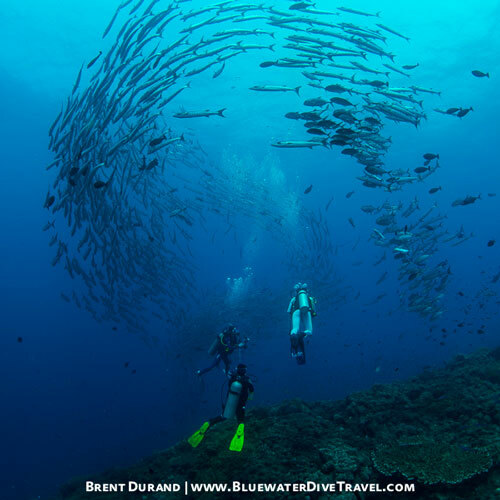 Let the experts at Bluewater Travel plan and book your dream dive trip to Papua New Guinea. 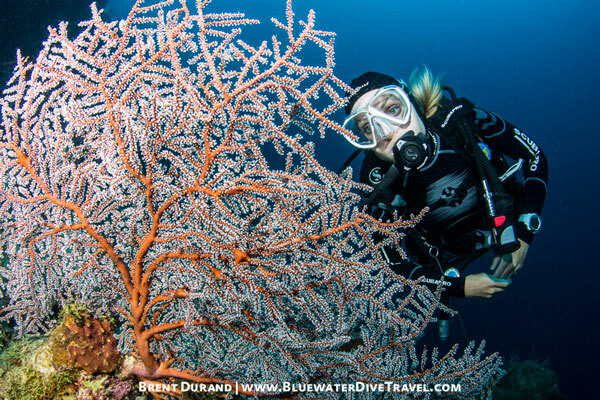 Find more information on their Papua New Guinea dive travel page.